The user chooses which number they want to dial for access. Perfect for apartments, dorms, etc. Telephone entry systems are used as a reliable and efficient method for controlling visitor access at secure entry points. They work by providing direct two-way verbal communication between the entry point and someone, often remotely located, with the authority to grant access. 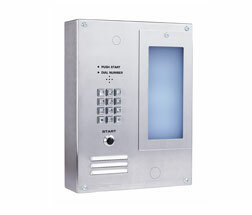 The intercoms can also be used in a multitude of different environments, including apartment complexes, office buildings, gated communities, and some are even tailored specifically to single-family homes. Our collection of telephone entry systems is broken down into three main categories; auto-dial entry control, home visitor entry control, and multiple residence entry control. Each category is designed with unique aspects and advantages to best suit the user's diverse needs. The three categories are briefly described below. These telephone entry systems store and dial pre-programmed numbers that are called when a person presses the button on the device. If a call goes unanswered, the phone is capable of calling an additional nine backup numbers. Once a connection is made, access can be granted. This line of intercoms was designed specifically for private residences. One major advantage of these home visitor entry systems is that there is absolutely no phone charge involved. Not only do they allow residents to allow entry when they are home, but they are also capable of call forwarding request for access when residents are not home. A series of intercoms designed to act as corporate/industrial telephone entry systems. They are Ideal for apartment complexes, office buildings, and situations when the user determines the number to be dialed. Once communication is made, the resident can allow access by pressing a tone on their phone. Copyright © 2013 Destined Commodities Inc. All rights reserved. and we can help you find a telephone entry system that can effectively fit your needs.